Oregon is home to the oldest permanent settlement west of the Rockies, so there are bound to be some old souls haunting the state. You will find them in historic forts, hotels, and even in underground tunnels. But there is more to Oregon’s eerie past: From witches and imps to UFO there are plenty of places for the spooky and mythic to lurk in this large state. 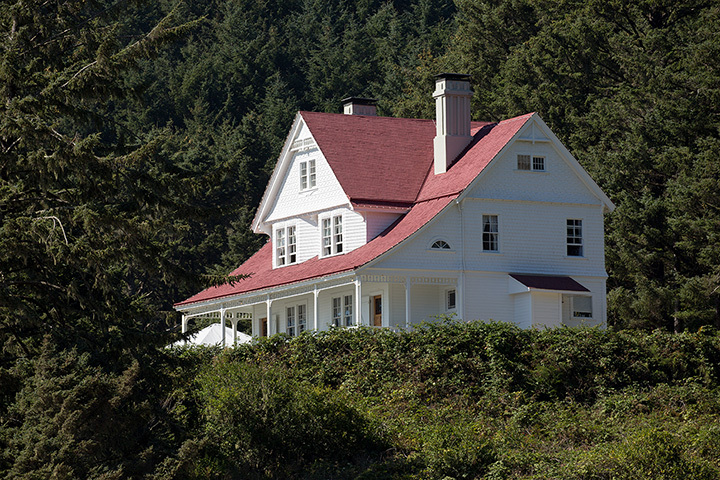 Heceta Head House is the lightkeeper’s house for the Heceta Head Lighthouse, the home was turned into a bed and breakfast in the 1950s. Nearly every guest who has stayed there has reported some form of paranormal activity, including items moving in their rooms and disembodied screams. Most activity is attributed to Rue, also known as the Grey Lady, who lived in the house around the turn of the century. It is said that the dead volcano, Malheur Butte, overlooking Ontario, Oregon, on the border of Oregon and Idaho, is the home of many secret witches’ ceremonies. The witches draw from the power of the Snake River, one of the only two rivers in the U.S. that runs south to north. People have also reported being chased by dark shadowy imps the size of dogs. Located in Union City, the Hot Lake Hotel is regarded as one of the most haunted places in the state. The hotel went from rather unknown to a lavish space costing $500,000 to construct, with its completion coming in 1908. That’s a steep price for those times. In 1917, Dr. Phy purchased the property, converting the third floor of the building into a hospital, complete with spaces for operations and rooms to house patients. Following World War II, the space was converted again into a nursing home and asylum. This lasted until around 1975. The space was used several more times for different operations, until 1991 where it felt into such far stages of disrepair that it was left abandoned. Naturally, the hotel is now incredibly haunted. Reports say that ghosts of former hotel guests have been spotted on the property, disembodied voices and whispers, footsteps, the whole package of a haunted place. In 1950 Farmer Paul Trent took two photos of a large metallic looking disc that his wife Evelyn say hovering in the sky over their farm. The photographs were published in several magazines, including Life Magazine, as one of the most credible sightings of a UFO even captured. Under the city of Portland, there are a series of tunnels connecting hotels and bars to the waterfront, built to move supplies from boats to their basement storage unit. The tunnels were also used for illegal activities from 1850-1941, such as human trafficking, and resulting in the death of many people. You can still hear the deceased talking, moaning, and screaming. Built in the 1800s, the hospital was an insane asylum where patients were routinely mistreated and abused. Experiments were rumored to have taken place on their helpless patients in the hospital’s underground tunnels. Today a portion of the museum has been turned into a museum where visitors often claim to experience paranormal activities. This Cannon Beach-area urban legend tells the story of a ghostly man walking around covered in bloody bandages head to toe. The Bandage Man is known for jumping in front of passing cars headed into town. Allegedly the man died in a gruesome saw mill accident. McMenamins is the pride of Oregon, the company converts historic buildings into hotels, restaurants, and other establishments—ghosts and all. At the Grand Lodge in Forest Grove, staff and guests have reported a ghost of a woman with white hair, slippers, and a patterned dress walking the hallways of the hotel. They are even more surprised to see a painting of this woman hanging in the hotel. It is believed to be the ghost of Anna, a woman who lived in the hotel for many years and passed just before turning 100 years old. From the 1920s until the 70s, Jantzen Beach Amusement Park on Hayden Island was a widely popular tourist attraction. A litany of issues included fires and several deaths led to the park’s demise. The space was then used for a mall which actually featured the park’s original carousel. But in 2012, when the mall underwent renovations, the old carousel was put in storage. Then the strangest thing happened. In 2015, when city officials went to retrieve the old carousel to put it back in the mall, it was gone. There are varying reports about the whereabouts of this mysterious carousel but either way, there is certainly some spooky, strange things happening here.